Are you a marketer trying to forecast the potential SEO return on investment (ROI) for an ecommerce website but don’t know where to start? Good news. You’re going to learn how to do that today. Here’s a little technique you can showcase to huge ecommerce sites to let them know the potential SEO ROI they can get by ranking for some target keywords. 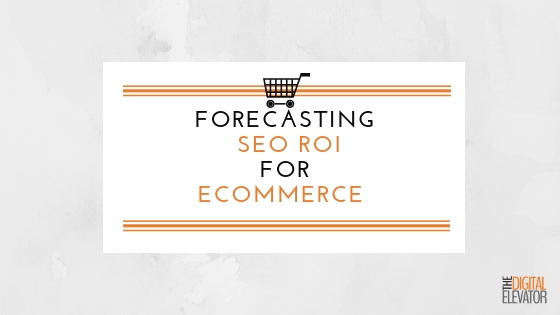 So, before you learn how to forecast SEO ROI on ecommerce sites, let me give a little context to this particular evaluation. Did you know that you can order steaks, seafood, poultry, and other meats straight to your door? Of course you did, and this is actually quite a large market, particularly dominated by Omaha Steaks. Perhaps you’ve even ordered a ribeye or two. Mmm. 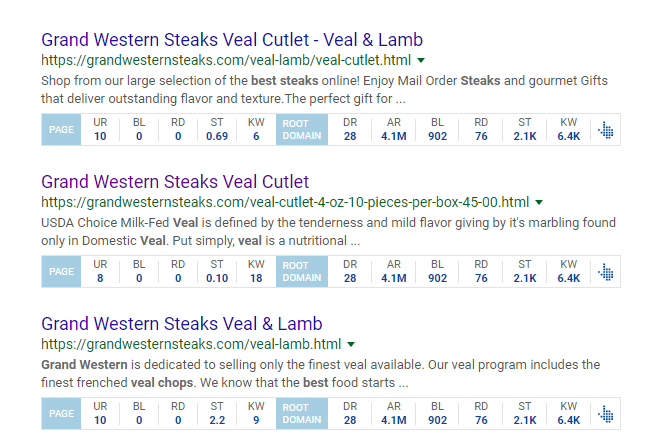 Anyhow, for this ecommerce SEO ROI forecasting example the focus of my example will be Grand Western Steaks, an ecommerce meat and fine foods provider that doesn’t have anywhere near the search engine results pages (SERPs) dominance of Omaha Steaks. Because they don’t have the SERP market share of their competitors, therein lies an opportunity to see what the potential ROI of SEO can be. One thing that you’ll notice in this SEO audit of sorts is that I used some domain-level metrics as well as broke out one example of a single product for a comparison point. If you were to break down the SEO potential of each product on a site of this magnitude, you might as well just go ahead and get the authorization to perform SEO on the whole site. Breaking out a product or two makes this sort of recommendation easier to digest for the powers that be and almost makes your job of providing this type of analysis a little bit easier. With some imagination, it would be easy to see how much revenue potential a finely tuned SEO campaign could work across all products. Anyhow, the first step in this SEO ROI audit is to determine who the competitors are. 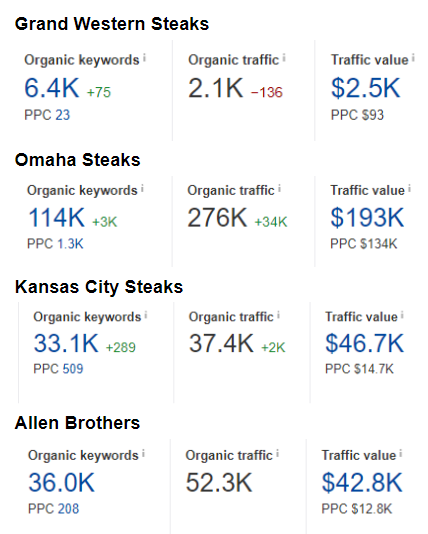 Start with the below competitive analysis to identify opportunities within the search engine results pages for queries related to the products and services provided by Grand Western Steaks (or your client). Namely, high volume keyword opportunities that show buyer intent (more on this below) indicate great potential to increase sales if search engine rankings can be increased. We can also compare that to other competitors in the space to estimate how profitable their websites are due to their SEO efforts. I use Ahrefs to get an idea of these metrics very quickly. Their Site Explorer tool provides a quick overview of the initial information we need to compare competitors. In this case, I was already familiar with their competitors and ran them each manually through Site Explorer. However, if you are unfamiliar with the competitors of a site you are looking to compare, simply enter some keywords that your target site sells into the SERPs, document the sites that rank in the top three, and then run those sites through Site Explorer to get the below high level info. Note: Ahrefs also has a “Competing Pages” feature you can use to see what sites they think are similar in keyword targeting. Organic keywords- Shows the total number of keywords that the target website ranks for in the top 100 organic search results. Organic traffic- This metric estimates the total monthly search traffic to the target website from the top 100 organic search results. It is calculated as the sum of traffic from all organic keywords for which the target ranks across all countries in our database. Traffic value- This metric shows the equivalent value of the organic search traffic, should that traffic have been acquired via Google AdWords. Now we have a baseline for how many keywords our site and our competitors have within the top 100 results (organic keywords), how much traffic from those keywords Ahrefs estimates (organic traffic), how much the organic traffic that comes to the site would cost if paid via Google Ads (traffic value), and much Ahrefs estimates a site is paying for Ads (traffic value: PPC). To help provide a side-by-side comparison, here’s a graph that shows those metrics. When you put a site up to competitors like this, it’s easy to see how Grand Western Steaks is leaving money on the table. They have about one fifth of the keyword share as the next closest competitor (Kansas City Steaks), and about 1/18 of that of Omaha Steaks. If you’re wondering why the organic keyword share and the organic traffic share can be so far off, remember that organic keywords shows keywords that rank in the top 100 while organic traffic is an interpretation of clicks. Solely on the above we know that there is tremendous opportunity to gain some traffic share. You can move straight on to the potential monetization example below if you’d like from here, but I want to show where, exactly, I believe this site is missing out on this traffic. This is where context comes into play. One of the primary opportunities found with the site is the potential optimization of each product. For example, not optimizing for purchase-related keywords -- buy, shop, order, sale, wholesale, etc -- can lead to lack of rankings for potential customers who have online ordering intent, or as we have seen, lead to the ranking of paid ads where the intent for a purchase is not evident. 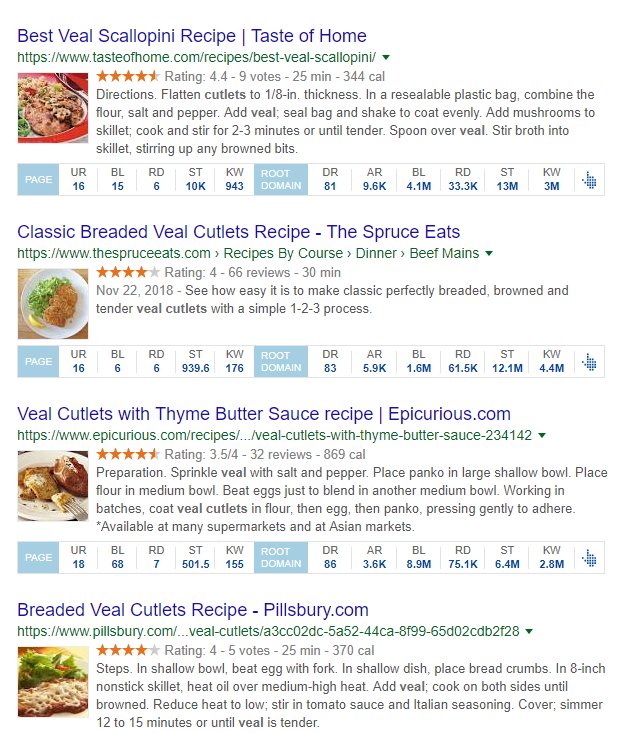 For example, a search for “veal cutlets” (something Grand Western Steak is targeting with ads), indicates, according to Google, the intent for a searcher to look for recipes. What has been identified across the board on the site, and an area for opportunity as it relates to gaining market share in search engines and better competing for more keywords and selling more products, is including buyer intent optimization to all the products. For example, the current veal pages are not optimized for buying intent as they lack buying keywords in their title tags. In a way, this site is competing for the recipe searches rather than transactional ones the way it is currently optimized. An example of an optimized title would be something like “Buy Veal Cutlets Online | Overnight Shipping | Grand Western Steaks”. Additional optimizations to the product pages could also be implemented to better compete for buyer intent keywords (but that is a separate blog altogether). To forecast the ecommerce SEO return on investment, what I want to do now is find some product-related examples, determine their total search volume, and do some quick calculations. From there, you’d just divide the amount you’d make from the potential revenue by the amount you pay for SEO. Now let’s assume a 5% conversion rate of paying customers with an average order of $200. Of course, this is just one keyword example amongst 100s of products which demonstrates why the organic values in the chart above for the competitors are so much higher than Grand Western -- the competitors have invested in SEO and have keywords that rank well that account for their larger percentage of traffic from search engines. Now, I’m assuming you already know how to calculate ROI but we’ll want to make this really easy for those CEOs to understand, right? Rather than going after the entire site and trying to dominate rankings for each product, I’d suggest you take your/your client’s ‘s top five products. Let’s also assign your SEO investment so we can mash the numbers together to get the ROI. In this example, let’s also assume the five products all have the same search volume, same conversion rate, and average cost of the example above (2,900 searches, 5%, and $200, respectively) for simplicity sake. You can then calculate the potential revenue of ranking 1-3 for those five, $200 products. Of course, this doesn’t account for caveats like the fact that not every product will rank #1, 2, or 3, that these are the only keywords that will result in sales, or that ranking outside of the top three could still equate to sales, or that there will be a ramp up period. These are just general, big picture numbers, that showcase the potential of SEO for a few select products. But as you can see with Grand Western Steaks, the potential to target some lucrative keywords can pay off. I use this formula as sort of a proposal for bigger ticket clients and you can too. What else would you add to this or what other techniques do you use to showcase what SEO can do?